Dementia and Alzheimer’s disease are common mental health conditions, especially among older adults. It is estimated that one in nine people over the age of 65 suffers from Alzheimer’s disease. 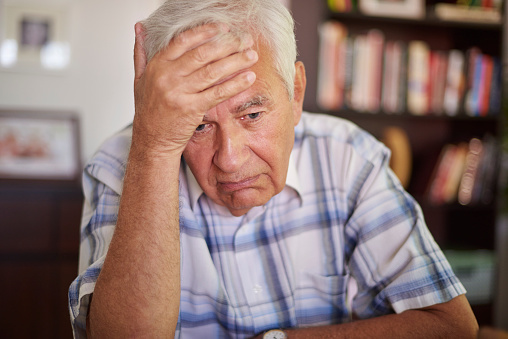 Depression is also a common mental illness that affects nearly one in five older adults. In particular, major depression affects nearly seven percent of all American adults. Depression is also commonly connected with diabetes, affecting over nine percent of the U.S. population. Stick with me here. In a recent meta-analysis published in The American Journal of Psychiatry, researchers at the University College London found that people with mild cognitive impairment (MCI) have a high risk of dementia, especially when they also have diabetes or depression. MCI is considered a precursor of dementia—about 46% of those with MCI will develop dementia within three years.The review analyzed data from 62 studies, and followed 15,950 people with MCI. MCI progressed to dementia in 65% of people who also had diabetes. People with psychiatric symptoms, like depression, were also twice as likely to develop dementia.After poring over the research, I began to wonder; if these conditions are linked, then maybe their natural treatments are connected as well! It turns out there is a connection between certain nutrient deficiencies and other possible treatments for dementia, diabetes, and depression. There are common nutrient deficiencies among people with depression, Alzheimer’s disease, and diabetes. This includes a lack of vitamin C and zinc. Vitamin E deficiency is also common in diabetes and dementia patients, while diabetes and depression patients usually lack vitamin B6 and omega-3 fatty acids. Also, people with dementia and depression are generally deficient in B vitamins, especially B1 and B12. These deficiencies should be addressed with supplementation and diet changes. Acupuncture is known to improve mood and depression, especially in patients with mild to moderate Alzheimer’s disease. Acupuncture treatment can help relax the nervous system and may also improve insulin sensitivity. A 2000 study presented at the World Alzheimer’s Conference reported that Alzheimer’s patients could significantly improve their symptoms after receiving acupuncture. Clinical studies mainly support acupuncture to treat diabetic neuropathy; however, there is a lack of randomized controlled studies that support the use of acupuncture to treat diabetes in general. In China however, acupuncture it is still considered a common diabetes treatment. There is supportive evidence for using ginkgo biloba extract in treating dementia, Alzheimer’s disease, and depression. Ginkgo biloba is especially useful for treating depressed patients over the age of 50. Studies suggest that ginkgo biloba extract may counteract the reduction in serotonin receptor sites. There are also studies that link ginkgo biloba with improving circulation in older adults. This enhances memory, which may reduce the onset of Alzheimer’s disease. Furthermore, studies have found that ginkgo biloba may treat diabetic-related complications, such as diabetic foot ulcers, diabetic nephropathy, and diabetic neuropathy. A whole foods diet is definitely the way to go, especially one that includes high amounts of nutrient-dense vegetables. The Paleo diet would be a good approach to help address the nutrient deficiencies prevalent in these conditions. It contains high amounts of vegetables, some fruit and grass-fed meat, nuts and seeds, and low amounts of non-gluten grains. The diet also contains low glycemic index and glycemic load foods. These foods will help control blood sugar levels, insulin resistance, and other diabetes complications. Furthermore, the Paleo diet doesn’t contain refined carbohydrates, but it is high in fiber. These factors also decrease the risk of diabetes, dementia, and depression. The diet should also not include dairy or bread products, as these foods could aggravate mental illness symptoms. Remember—regular exercise, an active social life, quality sleep, and stress reduction are also important for reducing all three conditions. Regular exercise can include anything from walking, gardening, or cleaning the house. Qigong, tai chi, yoga, and meditation are also gentle exercises to help reduce the prevalence of diabetes and mental illness. Cooper, C., et al., “Modifiable predictors of dementia in mild cognitive impairment: a systematic review and meta-analysis,” The American Journal of Psychiatry 2015; 172(4): 323-334. “Diabetes, depression predict dementia risk in people with slowing minds,” Science Daily web site, February 20, 2015; http://www.sciencedaily.com/releases/2015/02/150220133335.htm. Murray, M., et al, The Encyclopedia of Natural Medicine (New York: Atria Paperback, 2012), 276-291, 478-502, 503-547. “Alzheimer’s Disease and Acupuncture,” Acupuncture Today web site; http://www.acupuncturetoday.com/mpacms/at/article.php?id=27681, last accessed July 8, 2015. “Type-2 Diabetes,” British Acupuncture Council web site; http://www.acupuncture.org.uk/a-to-z-of-conditions/a-to-z-of-conditions/type-2-diabetes.html, last accessed July 8, 2015. Liang, F., et al., “Acupuncture: is it effective for treatment of insulin resistance?” Diabetes, Obesity & Metabolism 2010; 12(7): 555-569. “Major Depression Among Adults,” National Institute of Mental Health web site; http://www.nimh.nih.gov/health/statistics/prevalence/major-depression-among-adults.shtml, last accessed July 8, 2015. “Statistics About Diabetes,” American Diabetes Association web site, June 10, 2014; http://www.diabetes.org/diabetes-basics/statistics/. “2015 Alzheimer’s Disease Facts,” Alzheimer’s Association web site; http://www.alz.org/facts/overview.asp, last accessed July 8, 2015. Smith, M., et al., “Alzheimer’s and Dementia Prevention,” HelpGuide.org; http://www.helpguide.org/articles/alzheimers-dementia/alzheimers-and-dementia-prevention.htm, last accessed July 8, 2015.